I love a good alpha male romance. I struggle, though, to find good alpha male romance stories in today’s contemporary Christian fiction market. I can freely admit that this might just be my problem. Maybe I’m looking in the wrong places. Who knows? 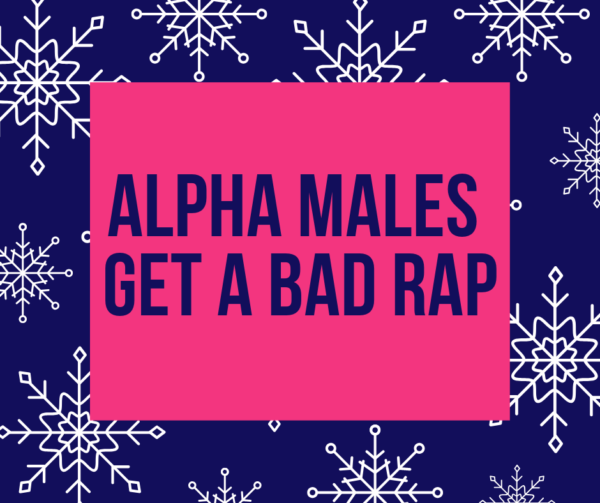 I’ve given it some thought, though, and I’ve come to a conclusion: alpha males get a bad rap. Alpha males are seen as hard, cruel, and often misogynistic. Either that, or the hero is strong and powerful until he falls in love – whereupon he immediately turns into a pile of goo. This is completely my own reader preference – but I don’t feel like either of those approaches does the alpha male character justice. Neither do either of those approaches particularly reflect Christ. When I think of an alpha male, I think of someone with a take-charge attitude, someone who is hard-wired to be a leader instead of a follower. Can that sort of character exist in Christian romance? Can an alpha male learn to submit to Christ and still be an alpha male? It’s an interesting question. I have my own opinion, but I’d love to hear yours! Do you think there is a place for alpha males within the contemporary Christian romance market? Do you enjoy that type of romance? Tell me about your ideal swoon-worthy hero, alpha or otherwise. Hi Heather- what a great topic to explore! I do think that there is a role for an alpha male hero in Christian fiction- it’s not like Jesus was a wimp who sat back and let others dictate how He behaved! Look at His actions in the temple with the money lenders, with the Pharisees…and so many more! Great to hear from you Wemble! Excellent point – Jesus was not a wimp. We hear a lot in Christian circles about the importance of being meek, and I recently heard someone say, “Meek doesn’t mean weak,” and that’s so true. Hi Heather! I think there is a role for alpha males in Christian fiction. Hmmm I have a Ronie Kendig book ( I think she’s A Christian author) and i think her males would qualify as alpha. I think her male characters would qualify as alpha…idk I’m not clear on what an alpha male really is, so please, forgive me. But you might try one of hers. Her character Tox from the Tox files comes to mind. I adore alpha male heros…. definitely my type!! I agree with everything you said an alpha male should be!! I don’t think they should turn to goo when they fall in love, but they do need to relax a little…lol… still be in charge, but ‘she’ needs to be heard as well! Hi Paula! I think that (at least, in my mind) it sort of takes an alpha female – or close to it – to stand up to be able to stand her ground with an alpha male. Nobody wants to see the heroine get swallowed up by the hero’s strong personality. It all depends on your definition of alpha male. Since you mentioned a leader as the definition, then we need to go back to the definition of leader. Jesus, while in no way a wuss or a pushover, lead by example. He said the greatest in the kingdom would be a servant. He was humble and kind and gentle. These are not usually seen as characteristics of an alpha male. I personally don’t gravitate towards alpha males, though I looked for a husband who was decisive, wise, and a good leader. This is the “good guy” persona I want to read more about — not a cocky, arrogant, almost “bad boy” persona. Good post, Heather……I’ll be thinking on this one all day……lol! I think you can be an alpha male and still be God honoring God loving. In fact I think that is what God wants. Just as you can be a submissive wife and still be bold and strong. I think a lot of people don’t have a really good idea as to what these terms mean. They have the idea a submissive anything means you lie down like a rug and let people walk all over you when that is just not the case. Especially if we keep the picture of being Christ like in our minds at all times. Great point, Pam. Thank you for sharing! I think you’re so right. As believers, we’ve often allowed society to tell us what certain aspects of our faith mean – things like submission. The problem with letting society define submission for us is that society isn’t getting its definition from God’s word. When we reject what society is saying about our faith and instead turn to Scripture to define what we believe (and why we believe it), everything falls so much more smoothly into place. I think there are too many labels out there. I can see as an author where labels might be helpful. I like male characters who are handsome, kind, patient, etc., all of the traits we all should have. So even female characters should have these very needed traits. No one is perfect, we can present our bad side some times even tho we are very good people. So I think as a Christian I like to read about a man who treats a woman as an equal. Man is not superior as God’s word says all are created equal. Well said Virginia! A man and woman on equal footing creates a fun kind of tension that makes for a fabulous story. And you’re probably right. I’m not sure I ever used labels for people until I started writing. In my defense, I don’t actually use labels when I think about people – just characters. ^_^ People are people – the good, the bad, and the ugly. We all fight the flesh, and as Christians, we all love Jesus. We all make good and bad decisions. For us as people, it’s more about the journey – the growth – making more good choices than bad choices over time, getting better at fighting the flesh over time, etc. In a book, though, we generally get a smaller window in the lives of the characters. We don’t get to see their growth over time. It’s a challenge (fun, too) to try to present the characters in such a way that the reader can grasp their personality and where they are in their faith walk in the relatively short space of chapters. Heck ya. I really prefer an alpha male hero, and I think it can be done well or badly. A man that treats children and animals well, isn’t rude or antagonistic with the heroine of the story as the conflict or obstacle of the story and a man who overcomes challenges in the plot without having tantrums or self pity is more attractive of course. I like the heroes that are capable and kind. Devastatingly handsome of course and oblivious to their own charms is nice, too. You made me chuckle, but I totally agree. Whether you’re two, twenty, or forty-two — tantrums simply are *not* attractive. :-) I think capability is key, too. It doesn’t matter what the hero does for a living or how he makes his way in the world. What matters is that he cares about it and that he’s good at it. Artist, coffee shop owner, or high-powered attorney – he simply needs to do well whatever he’s chosen to do. The single-minded focus required for that kind of success carries over beautifully into romantic relationships, especially for an alpha type of hero, someone who doesn’t allow failure to be an option and turns that same kind of single-minded focus to the woman he loves. My husband is an alpha male. When he became a born again Christian he learned how to take his overbearing ways and change it into his passion for the Lord. He is protective of his family yet we know he loves us.